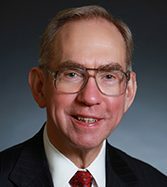 Stephen M. Robinson is Professor Emeritus of Industrial and Systems Engineering and of Computer Sciences at the University of Wisconsin-Madison, on whose faculty he served during 1972-2007. Robinson also holds the rank of Colonel (Retired) in the Army of the United States. His research specialty is in variational analysis and mathematical programming: methods for making the best use of limited resources, applied in logistics, transportation, manufacturing and many other areas. He is author, co-author or editor of seven books and 105 scientific research papers, and has directed numerous funded research projects at the university. His accomplishments have been recognized by the award of the honorary doctor’s degree from the University of Zürich, Switzerland, the George B. Dantzig Prize of the Mathematical Programming Society and the Society for Industrial and Applied Mathematics (SIAM), the John K. Walker Jr. Award of the Military Operations Research Society, and the George E. Kimball Medal of the Institute for Operations Research and the Management Sciences (INFORMS). He is a member of the National Academy of Engineering, a National Associate of the National Research Council, a Fellow of INFORMS and a Fellow of SIAM. He served as President of INFORMS in 2014.